Powerful, road-tough unit for medium-sized gigs. 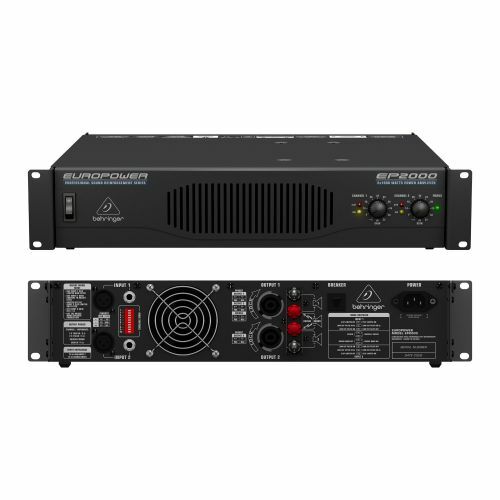 The rackmountable EP2000 EUROPOWER power amp from Behringer delivers up to 2 x 1,000 watts at 2 ohms, 2 x 750W at 4 ohms, and 2,000W at 4 ohms in bridge mode. Its Precise Power, Signal, and Clip LEDs let you monitor performance, and its XLR and 1/4" TRS jacks allow for compatibility with any source. Selectable low-frequency filters let you remove distracting infra-sound frequencies, and its independent DC and thermal overload protection on each channel automatically protects your amp and speakers without stopping the show. The Behringer EUROPOWER's professional speaker connectors and "touch-proof" binding posts support most speaker wiring systems.